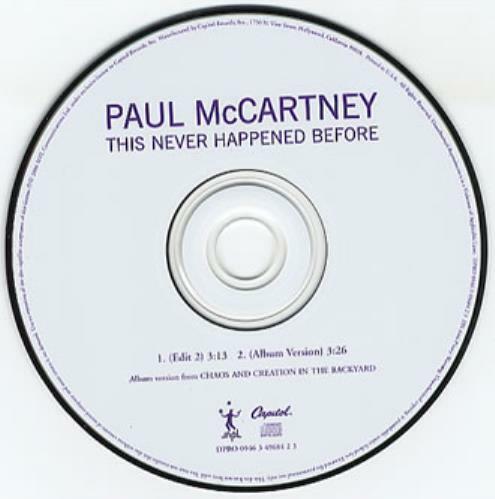 PAUL MCCARTNEY This Never Happened Before (2005 US 2-track promotional only CD including Edit 3:13 and 3:26 [Album] version taken from the 'Chaos And Creation In The Backyard' album. It's unusual for the 3:26 album version to have been cut down further for a 3:13 radio edit, as this is not an excessively long version anyway. However, it makes this CD an instant collectable - the modern day equivalent of a Wings radio edit demo 7" single! Comes complete with a custom Capitol records rice paper front insert and custom title/tracklisting back insert DPRO-49684-2).